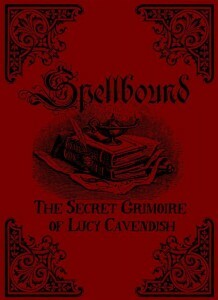 I wasn’t sure what to expect when I received my copy of Spellbound: The Secret Grimoire of Lucy Cavendish. Sure, I loved Harry Potter and The Worst Witch while growing up, but I had a feeling that the type of magic Harry and Mildred used was a little different from the ‘magick’ used by real witches. Even though I’ve known a couple of witches in real life, I’ve never asked them any questions or been told anything about their beliefs or practices. However, as Cavendish’s book is essentially a beginner’s manual to understanding the basics of magick, my lack of knowledge wasn’t an impediment. Cavendish is quick to dispel several misconceptions about witchcraft in Spellbound. She asserts that there is no such thing as ‘black’ or ‘white’ magick—only the intention and character of the person doing the casting. Harming others or trying to achieve negative outcomes is not only a bad idea, it will almost certainly cause bad side effects for the malevolent caster. Furthermore, anyone can access and harness the ‘natural power’ which comes from the Universe—there are no Potter-style squibs or Muggles. Spells, Cavendish maintains, are a way of getting in touch with this natural power, which has been lost in modern society. As the intention of a ‘grimoire’ is to provide instruction for others using the writer’s own personal experiences, Cavendish provides basic lessons for getting involved in witchcraft, from the stages of the moon to the eight traditional festivals, to working with deities and to various spells (all of which naturally produce positive outcomes—such as spells for love, protection, and success). To give you a little taste, I’ve included a small extract from the first spell in the book—a spell to ‘connect with your magical bloodline.’ At two pages, it’s a bit long to include in this review, but I’ve condensed it. Keepers of the magick of the line. None of the spells will have you crawling around in graveyards or pouring your blood into vials, but you might need to raid a few shops to get the required ingredients. Cauldrons and broomsticks are among the more stereotypical requirements, but you’ll also need a healthy supply of candles, important objects belonging to yourself (or, to the person you are hoping to cast a spell for), or even a lock of your own hair. Cavendish’s grimoire is imbued with a positivity that is almost infectious. She is a big believer in taking control and transforming desire into action. It’s not enough to just buy the right supplies and have the best intentions—just like buying gym equipment won’t make you fit and athletic unless you put in the effort. The idea that we are all connected and that we can make amazing changes in our lives is incredibly empowering. However, there is a downside to this train of thought. Very early on in the book Cavendish mentions the motivational speaker Louise L. Hay, who ‘believed she had cured her cancer by finding the connection between the part of the body affected by the cancer and her mind.’ Hay managed to change the way she thought, and, in time, ‘her body grew stronger and healthier. She had manifested cancer with her thoughts. She manifested health by changing her thoughts’ (emphasis mine, p. 37). This anecdote, though only a small part of the whole, was a major trigger for me. As someone who has lost loved ones to cancer, and as someone who continues to see the damage that cancer can do to a previously healthy body, I was unable to take the rest of the book seriously. Positivity and spirituality are fine things to get behind, and can do a lot to maintain health, both physical and mental, but ignoring—and encouraging others to ignore—medical tradition is something I cannot stand. Overall, Spellbound is charismatically written and well-organised, and would be useful to anyone wanting to know more about witchcraft. While the cancer story was a deal breaker for me, Cavendish’s overall message of self-worth and self-empowerment is commendable. This entry was posted in Books and tagged magick, self-help, spells, witchcraft, witches. Bookmark the permalink.